This unpublished woodcut is one of the few works by Yolanda del Riego (YR) that depicts a human subject. Created in 1999 for International Women's Day, it expresses her personal interpretation of the state of gender equality at that time. As if an initial attempt to reconcile the two genders, YR has merged the masculine and feminine into a single abstract face, a cascade of hair on one side offsetting the baldness of the other. Small beady eyes stare out from the base of a phallic-shaped nose, which extends down to a thinly drawn mouth. The symbols of femininity and masculinity seem to hang, like weights, from the pursed lips. Rough gouges frame the face and, along with the coarse wood grain of the plate, set a primitive tone that reinforces the artist’s portrayal of the lamentable state of gender equality. The work is framed on three sides by the repeated text "Ella=El" (She=He) crying out in protest. In addition to relief printing*, YR has also intaglio-inked the plate to highlight the grooves defining the face. Each print in this unpublished evolving edition has been printed on handmade Heavy Koso paper and hand-dyed with pigments, making each impression unique. *Relief printing is the traditional method for printing woodcuts where ink is applied to the surface of the plate and the recessed areas are left ink free. 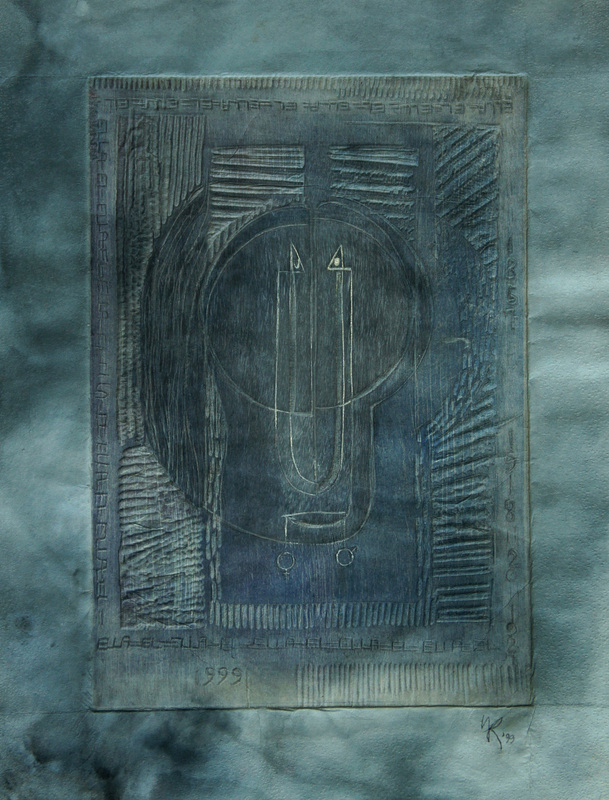 Intaglio printing, traditionally used with etched metal plates, involves pushing ink into the recessed areas and then rubbing the surface clean with a cloth ("a la poupée"). YR often combines both processes when printing her woodcuts and linocuts.